G Force Measuring Comparing Devices. “My first exposure to Sea Knees came about two years ago. Paul Nowack, the inventor and I have known each other for more than twenty years. We have shared many adventures, had many opportunities, and watched others take common sense ideas and create successful products. The products succeeded because they met a need that people recognized. “Sea Knees” is one of those products. In the early years of our association, we both shared a love for the water and boating. I spend most of my time on Lake Michigan fishing for Salmon and Smallmouth Bass, and Paul had a need for speed, becoming well known among the river boaters of the Fox River in Northern Illinois and Off-Shore Poker Runs along the coastlines of Florida. Both of us boaters, and many of you with many hours on the water, discovered that we could make a “better ride” by standing on the balls of our feet, elevating our heels, to “mitigate” this shock. But for those of you that also discovered this concept, there was a downside. You could only stand on the balls of your feet for a limited amount of time before your legs began to cramp from the unnatural position. This is how most people first experience “shock mitigation.” Using the natural ability of the body to absorb shock, we were able to go further and faster in heavy sea conditions in our boats. So how do you eliminate or mitigate boat cramping and boat fatigue? Well, Paul’s idea was, “you put the body back into a more natural position.” One our muscles are familiar with, but at the same time keep the energy from being transmitted directly to our body, feet, legs, hips, spine, shoulders, neck and head by allowing our heels to “float” above the deck. The boat fatigue solution is Sea Knees. An elegant and simple invention that allows the natural action of the body to absorb energy without putting our skeletal muscular system in an unnatural position. Sea Knees allows our heels to float above the deck, while maintaining a normal stance and providing “Shock Mitigation” while standing. There are many circumstances where standing is the best solution to piloting your boat. If you’re sitting in a chair, Sea Knees will not help you. However should circumstances such as sea conditions, visibility or pleasure make standing the best position, Sea Knees – Shock Mitigation for the Standup Boater is the best available solution for shock mitigation from waves. Sea Knees is a boat shock mitigation boat strategy that greatly reduces the impact on the knees and other joints in the body from boat shock caused by waves and chop. A boat shock mitigation strategy is essential for all crafts that undertake open sea transits or operate in rough or choppy local water. Sea Knees is Trade Marked and Patent Pending. CAUTION – When on Sea Knees, the best riding boats are improved so much, that care should be taken, to not overdrive the boat and consideration given for any passengers not on Sea Knees. I’m here to assist and service boats, boaters, standup boaters, boat companies and boating organizations with all their boat shock mitigation needs for a best riding boat. 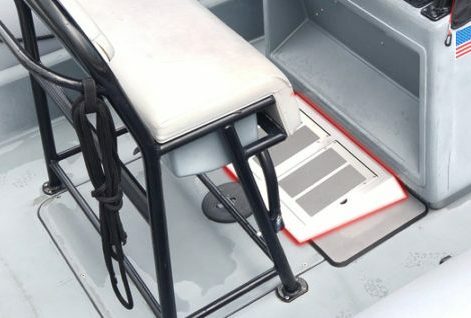 Best riding center console boats are those boats equipped with Sea Knees. 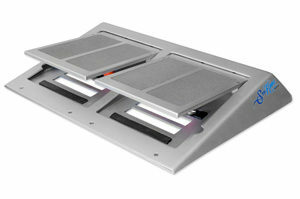 SeaKnees is the first device for Vibration Dampening and Shock Mitigation for the stand-up boater. Those boaters who pilot their boats standing up and for the passengers who prefer standing to sitting. Sea Knees is a shock mitigation boat strategy for best riding center console boats that greatly reduces the impact on the knees and other joints in the body from boat shock caused by waves and chop. A boat shock mitigation strategy is essential for all crafts that undertake open sea transits or operate in rough or choppy water. 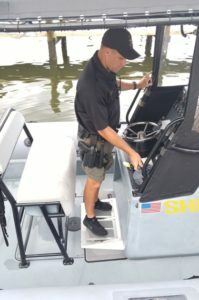 CAUTION – When on Sea Knees, the best riding center console boats are improved so much, that care should be taken, to not overdrive the boat and consideration given for any passengers not on Sea Knees. I’m here to assist and service boats, boaters, standup boaters, boat companies and boating organizations with all their boat shock mitigation needs for a best riding center console boat. Best riding boats are those boats equipped with Sea Knees. 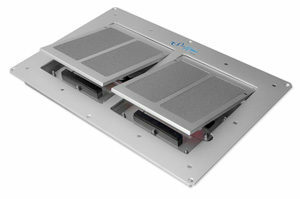 Sea Knees is the first device for Vibration Dampening and Shock Mitigation for the stand-up boater. Those boaters who pilot their boats standing up and passengers who prefer standing to sitting for the best riding boat. Sea Knees is shock mitigation for boats that greatly reduces the impact on the knees and other joints in the body from boat shock caused by waves and chop slamming against the bottom of the boat hull . Boat shock mitigation is essential to reduce physical fatigue and create a more comfortable and controlled (safer) ride for all crafts that undertake open sea transits or operate in rough or choppy water. CAUTION – When on Sea Knees, the best riding boats ride is improved so much, that care should be taken, to not overdrive the boat and consideration given for any passengers not on Sea Knees. The definition of shock mitigation is; “To make a violent collision or impact – less intense”. For boating, it’s the impacts with waves. This includes rivers and estuaries with wind against tide conditions, and even lakes can produce significant wave heights from wind blowing over open water. A shock mitigation strategy is essential for all crafts that undertake open sea transits or operate in rough water. Sea Knees is a shock mitigation for boats strategy that greatly reduces the impact on the knees and other joints in the body from boat shock caused by waves and chop. A boat shock mitigation strategy is essential for all crafts that undertake open sea, ocean, lakes and river transits or operate in any type of rough or choppy water. For the Standup Boater there are strategies that may reduce Fatigue, ( i.e. pads ) but not that effectively address “violent and not so violent collisions” encountered with waves. Sea Knees is now available, (trademarked and patent pending) a Shock Mitigation System for Boats “ strategy for the Standup Boater. While underway in a boat, a person can encounter multiple G forces that will pull them in different directions. Factors such as wave height, wave direction and boat speed all effect boating G-Forces. Boating Fatigue; reducing “G’s” will effectively reduce the stress and the associated fatigue. SeaKnees boat shock mitigation boating equipment reduces Boating G Forces and G Force boating injuries – Sea Knees “Takes the Motion out of the Ocean”.